The newest Pro Evolution Soccer 2015 Live Update was released this morning, as every Thursday. The new PES 2015 December 18 Live Update adds the latest squad updates, as well as recent formations and lineups. The PES 2015 Live Update additionally adjusts the ratings of more than 300 players to react on the latest league displays. Today's PES 2015 Update adds 17 players, including Rolando Aarons and Jak Alnwick of Newcastle United, Eric Bertrand Bailly (RCD Espanyol) who had a fairly good debut against Barcelona two weeks ago. Darwin Marchís and Isaac Success of Granada, who've been playing quite regularly so far this season, are also added to PES 2015 with today's update. Both Manchester United's David de Gea as well as Arsenal's Alexis Sánchez were yet to receive (significant) PES 2015 Live Update boosts, albeit their overally great performances so far this season. De Gea received +5 boosts on both key keeper attributes, goalkeeping and saving, while Alexis Sánchez, who's now valued at 86, was mostly increased in terms of attacking prowess and ball control. 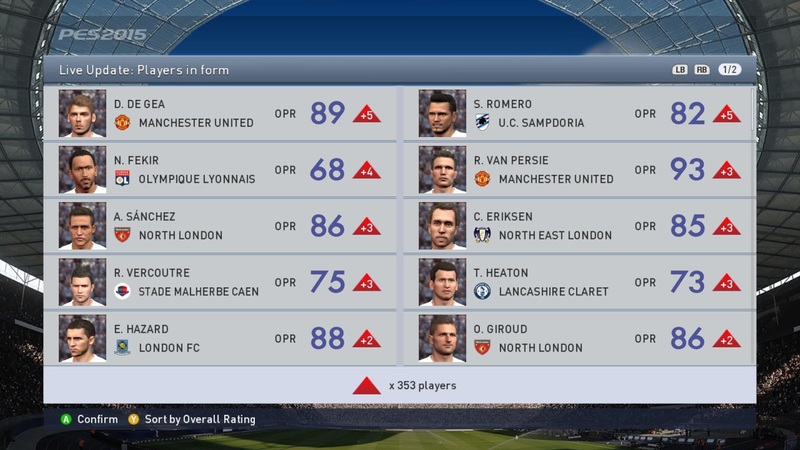 Robin van Persie was also once again upgraded, and is now rated at 93 (+3 from default rating), including 98 finishing and 95 attacking prowess - lucky you, if you have him in your PES 2015 MyClub team. Eden Hazard was also upped, by two, to 88, including +5 on his attacking prowess, ball control and low pass values. Other notable boosts in today's PES 2015 Live Update are Sergio Romero (+5 to 82), Nabil Fekir (+4 to 68), Christian Eriksen (+3 5o 85), Olivier Giroud (+2 to 86), David Silva (+1 to 88) and Diego Costa (+1 to 87). In total, 353 players got single values increased (60 with impact on overall value) and 40 players decreased (25 with overall rating impact).